Use these 10 strategies and learn how to think like a technical trader. To be a successful trader you need to read the charts, recognize formations, and identify your entry and exit points. The primary goal for any serious trader should be to put yourself in a position to participate in trades if and when price action dictates it. You need to know when there’s action to be taken—and how to take it. You can learn how to notice what the chart is telling you, and what action you should take by downloading our free how-to guide. 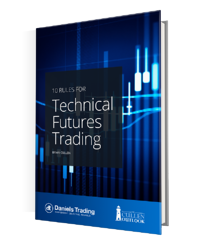 In this guide, we cover ten rules to follow in technical futures trading.